I totally should have gotten those shoes. 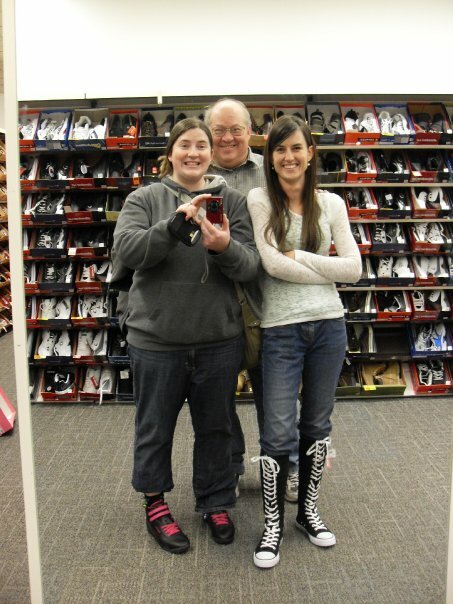 I'm not sure when it started, but for Christmas my dad takes my sister and I out shopping. He buys us our Christmas present, we go out to dinner, and my favorite part is just hanging out with the three of us. Mel (sister): I don't know how long I can handle shopping. My back is killing me, and if I stand for longer than like five minutes my whole leg goes to sleep. Jen (me): That's ok. I get dizzy just standing around. All the blood pools in my feet, and I have to sit down or move. Dad: yeah. right back at BOTH of you. It was destined to be a short shopping trip, but it wasn't. We had a hard time deciding what we wanted this year. STILL. Way fun. Love just being together. Making wrapping presents look beautiful. It started when we were all really little. My dad would take all of the kids out to do something, so my mom could finish putting together Christmas whateverness without the kids underfoot. 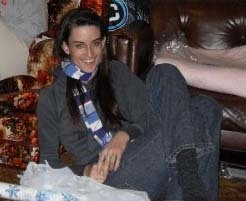 When I was around 9 or 10 years old, I decided I didn't WANT to go sledding, I wanted to stay home and help wrap presents. I don't like surprises. Never have. So, getting to see what everyone else got for Christmas the day before they did, was AWESOME! I liked being "behind the scenes" and helping my mom, and being in the know, and I just liked it. Eventually, my sister joined us. The boys go out and do "something fun". The girls stay back and wrap presents. I now have a couple sisters-in-law who don't get this tradition. And I get that. It sounds awful. The women stay home and work while the boys go play. In principle, I'm against this tradition., in reality, I love it! Have a very merry Christmas, Jen! It's great Jen, that you celebrate the way that you do. Just DO YOU. I don't celebrate any Hallmark holidays and it's brought an awkward experience to those I might interact with. However, I know that what is for me IS. And I like to see that others are reveling in their own joyous process. So I attempt to just be present for their interests. However, I do not dismiss all together my own way of wanting or being. That said, it isn't easy to not be the norm. But it is great you can be in a space that works for you. it inspires me to keep going towards the light that I know is my own. PS : I don't like surprises either. I feel much of that for me stems from the PTSD. I'm curious to know if this might be the case for you? PPS. May you find balance in the moments now and to come. May you realize that you do not "have" to be anything other than who it is you are. Paul - Merry Christmas to you as well. N - I'm finding my own way to celebrate and to live that fits ME. I love that you are finding your own way. It is very difficult when we don't fit in the norm. And yes, I think my dislike for surprises is part of the PTSD. I believe that even more strongly since my dislike for surprises is not as strong as it used to be. Healing has changed me. And thank you. I can always use the reminder to be me, and that I don't have to do anything but be me. I love being a big sister. The Help: Who knows what I become? Complete: I own all of me. Letting it all go. Right into the trash.